We were lucky enough to take part in Clerkenwell Design Week once again this year. As before, our stand was in the Project and the Chieftain team were surrounded by familiar faces. 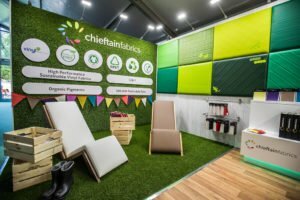 Chieftain’s ethos of sustainability was once more the key message of our stand. 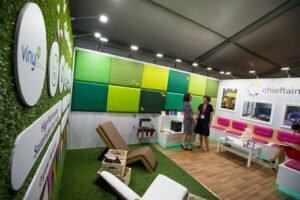 Wellies made from our recycled PVC proved a great talking point as people are becoming increasingly interested in recycling and protecting our planet. Our new PU range (Chieftain Luxe) drew a lot of interest also and we were delighted with the response to our colour choices. Our Summer soirée went down a treat on Wednesday night and gave us an opportunity to talk to our visitors in a more relaxed setting. Prosecco and canapés made for an enjoyable evening for everybody there. The party spilled out into the sunny Clerkenwell evening and conversation continued until late. The Chieftain stand stood out in the Project as it was so well-lit. Our upholstered panels (made by Global Upholstery) drew the eye as well as our loungers and seating area. 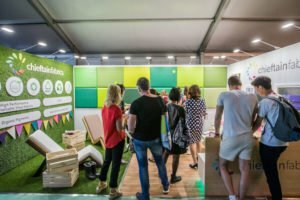 As a contrast to our (very) bright and colourful stand, marshmallows from the The Marshmallowist provided a sugar hit for tired visitors. 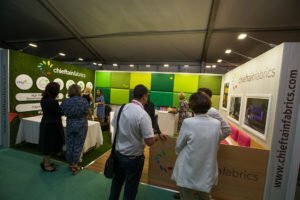 Chieftain Fabrics will return to Clerkenwell Design Week in 2019 to surprise and delight with several new ranges. We’ll see you then!